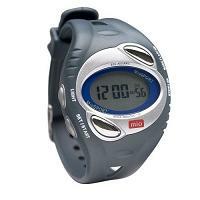 The Mio Sport heart rate monitor is a simple to use strapless heart rate monitor with ECG accurate measurements. It does not have a chest strap transmitter and requires that you put two fingers on the sensors on the wrist watch to measure your heart rate. Hence it measures heart rate on demand, rather than continuously. It is one model up from the Mio Wave model. Note that Mio Sport has 2 variants: Mio Sport Select and Mio Sport Select Petite. See below. Note that the features in bold above show the features found in Mio Sport but not in Mio Wave. You can buy optional additional interchangeable watch bands to customize Mio Sport Select and Mio Sport Select Petite's look, allowing you to choose a color that represents your style. The petite version is, as its name implies, for women with smaller wrists less than 6-3/4 inches in size. 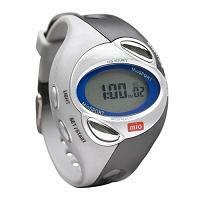 The Mio Sport and its variants will do the job if continuous heart rate monitoring is not required. It is a simple and easy to use heart rate monitor with a calorie counter and popular among women. 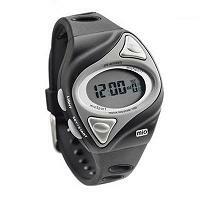 Reviews: This page has a concise summary of Mio heart rate monitor reviews. Further information: Visit Mio's official web site.